As a permaculture enterprise, the concept of fair share is at the core of what we do. Scholarships and discounts: Students from developing countries – we have a charter of partial or full scholarships (as needed) for students attending our courses from developing countries. Community discounts – we offer substantial course discounts to members of community gardens, transition initiatives and other important community initiatives. Fair Share rates – we offer discounts to people who need access to our education program, but cannot afford it. 107 Rooftop Garden – we’ve built a rooftop garden at 107 Projects to facilitate learning, increase city greenspace, local food and local pollinators. It’s an ongoing labour of love and the site of many ongoing Milkwood community events. Consultancies and advocacy – we gift consultancies and advocacy opportunities where we can, to organisations and individuals who need them. Free Film screenings – we host film screenings (with free organic popcorn!) of documentaries we feel are important and not easily found, in a range of communities. Community buzz – we promote community and permaculture events and initiatives wherever possible, as long as we know they’re happening! 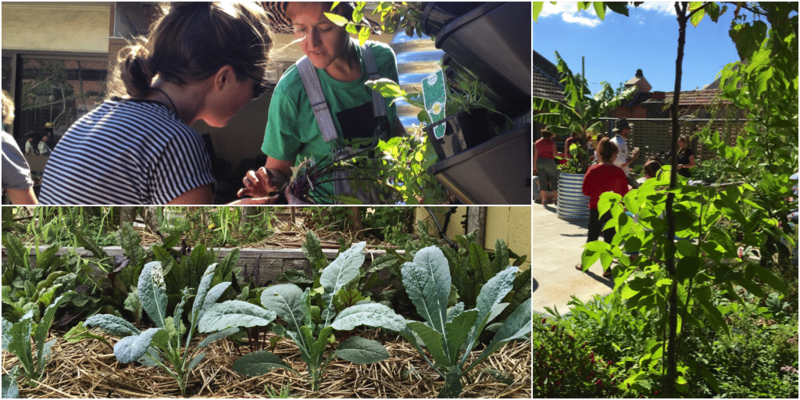 Creating gardens – we invest in creating edible landscapes for the communities we work within. Permablitzes – we fund plants, infrastructure, materials and lunch for over 70 people at our annual Alexandria permablitz. Students from developing countries – we have a charter of partial or full scholarships (as needed) for students attending our courses from developing countries. Community discounts – we offer substantial course discounts to members of community gardens, transition initiatives and other important community initiatives. Fair Share rates – we offer discounts to people who are unwaged or on a pension who need access to our education program, but cannot afford it. Asylum Seekers Center, Sydney – we offer full scholarships & additional support to asylum seekers who are looking for education opportunities as part of their re-settlement in Australia. Sydney Food Fairness Alliance – we gifted Joel Salatin for an evening talk in Sydney in 2010, raising over $4,000 for SFFA. Watershed Landcare – we gifted Joel Salatin for an evening talk in Mudgee in 2010, raising over $3,000 for WLC. Illawarra Councils – we gifted Joel Salatin’s time for a community event promoting local food and farming networks in August 2011, helping to raise over $3,000 for local community initiatives. Another ethic at the core of what we do is co-operation instead of competition. So wherever possible we collaborate and co-operate with organisations and enterprises engaged in complimentary activities. It’s the best strategy for creating regenerative land and communities for everyone. We’ve found that there’s nothing stronger than a collaborative force, whatever the challenge. Our planet is at tipping point and our role is to help in whatever way we can, and to create momentum by helping other organizations do the same.